• Oil - as needed 0. • Water - as needed 0. • Maida - 2 cup. Take a bowl add maida salt mix well the add water and make into soft dough and rest for 5 min take the rested dough kneed well for 2min then rest it again for 5 min Now take the rested dough divide into equal portions and make into balls by applying oil to hands and keep a side for 3-4min. Now take the rested balls and flat the dough by applying oil on the base and make into thin sheets and apply on top of the sheet and sprinkle flour and fold as shown in the video and rest for 2-3min now take the rested folded dough and roll like chapati and cook on both the sides by applying oil. remove the parata from tawa and with both the hands just push the parata with both the hands so that the layers comes out. Malabar paratha, the very name itself makes the mouth water. Any dish from the Malabar region is a delicacy. The delectable gently cooked, mild flavored malabar recipes are a pride to South Indian cooking. Kerala Parotta - Malabar Paratha Kerala Parotta is a very popular flaky pastry like multilayered flat Indian bread and a speciality of Kerala state, India. It is traditio... Read More..
Kerala Parotta - Malabar Paratha Kerala Parotta is a very popular flaky pastry like multilayered flat Indian bread and a speciality of Kerala state, India. It is traditionally made from maida (all-purpose flour). The flour is mixed with a pinch of salt and kneaded to soft dough and allowed to rise for few hours. This process goes through a little long labour and time intensive process. The flour is then stretched and flattened by hand in order to save the air pockets which arise from the stretching and then cooked on a griddle. Generally there are two variations of making the Kerala parotta, one is the Kerala parotta rich variety where maida is added with egg, milk and fat and prepared while the other is the normal or the plain variety without adding egg or milk. To prepare this parotta once needs to enjoy cooking and have quite some patience as the dough needs some good amount of beating with some expertise which would help in making the parotta soft and flaky. As the name suggest, the recipe is a Kerala variant of the North Indian paratha but requires using a technique which involves waving and puffing the dough so that the flat bread is formed of many layers. It is then grilled on a hot tava or griddle and served with any vegetarian or non-vegetarian curry. Kerala parotta with egg roast is a complete meal that is usually eaten during breakfast in Kerala. Kerala parotta can also be relished with vegetable korma or any gravy based dish. Parottas are more popular in the southern part of India. The most relishing parottas are the one that are deep fried. They are very famous in the southern part of Tamil Nadu, especially in Tuticorin, Viruthunagar and Madurai where they served it traditionally in a leaf. Another common variant is the South Indian Parotta available mainly in Tamil Nadu, which is smaller in diameter compared to the Kerala Porotta. Parathas are different from the Kerala parotta. Parathas are made with whole wheat flour and staple to northern part of India. There are many types of parathas with different variations given to them like aloo paratha, mooli paratha, paneer paratha and so on. To prepare this simple and easy Kerala parotta, firstly combine all the ingredients in a bowl and knead the dough together thoroughly like you prepare chapatti dough. Cover and keep aside or few minutes. Take the rested dough and knead well for 2 minutes and then again rest it covered for 5 minutes. Now take the rested dough and divide into equal portions and make into tennis size balls by applying oil to your palms and keep these balls aside for about 4 to 5 minutes (covered). Take a ball of dough and apply some oil on it. In a flat surface apply oil and make the ball of dough into a thin sheet pressing with your fingers (make it as thin as possible both lengthwise and widthwise. Do not worry about the shape or even though it breaks in between). Apply some oil all over the thin sheet and sprinkle some flour as shown in the video and rest for 2 to 3 mins. Using both hands make pleats of the rolled dough (just like the saree pleats J) starting from one end (check the video for clear instructions). Now holding one end of the pleated dough, start rotating it like a spiral and keep aside. Repeat the above procedure with all the remaining balls and keep aside. Take the rested pleated dough and roll like a chapati and cook on a hot tava on both sides applying oil. Remove the parotta and place it on a flat surface and holding them between both hands just push the parotta with both the hands together (just like clapping) so that the layers come out. Serve the Kerala parotta hot with any non-veg curry, egg roast, green pea masala or korma. Do try this recipe and before trying, you must watch the video. Every recipe of yours I tried today.. Has absolutely won me many hearts. They come out that well.Thank u thank u so much nothing could be better :)? Exactly what I was looking for. Thanks for your video chef!? hahahahaha.. now i learn how to wash my clothes..? chef,u r amazing.keep it up.? Awesome chef , I cooking mostly ur receipi.? Chef, I tried it and got very impressive and tasty parottas.... while making the dough you can add egg and little bit of sugar which will give even more tastier ones... ? 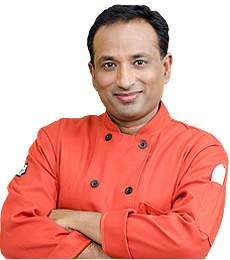 Namaste, chef Sanjay. Your recipes are awesome. Do we have to use so much oil in the recipe? Can I cook it without the oil on the pan? Thankyou. :) ? lol I like the sound effects. Thank you for the tutorial. My parathas never came out well, now I know why!!!!! I didnt allow the dough to REST at every stage.? hahahaa... lift it hit it!! that cracked me up! ?